1. Who should use SERVOsoft? SERVOsoft is for drive systems suppliers, machine manufacturers and systems integrators for machines, robots, product handling equipment and other servo based machinery. Who are dissatisfied with basic single axis sizing tools and custom spreadsheets, which are incapable of sizing complete systems. 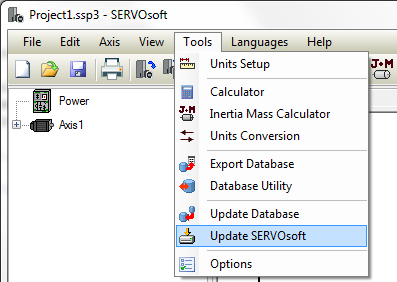 SERVOsoft is an engineering software tool that sizes complete servo systems including all electrical and mechanical components, with up to 50 axes and 15 mechanisms. Unlike many other sizing tools in the industry, which are typically focused on a single axis motor and/or drive, or gearbox or coupling, using simplified models and calculations, and therefore are incomplete. 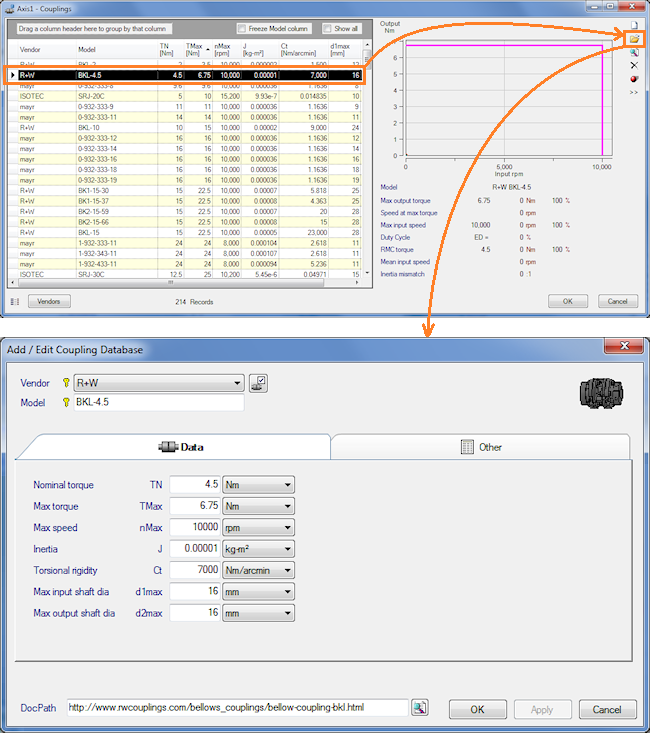 SERVOsoft is the only vendor neutral complete tool for sizing servo systems, using detailed models and calculations with no assumptions, creating better performing, reliable, efficient and cost effective designs with up to 80% time savings - every time. You may submit questions using our support and feedback form. If you download the Trial or Activation (ACT) versions, no USB dongle is required. The Dongle (DGL) version requires a dongle plugged into the user's machine to run SERVOsoft. 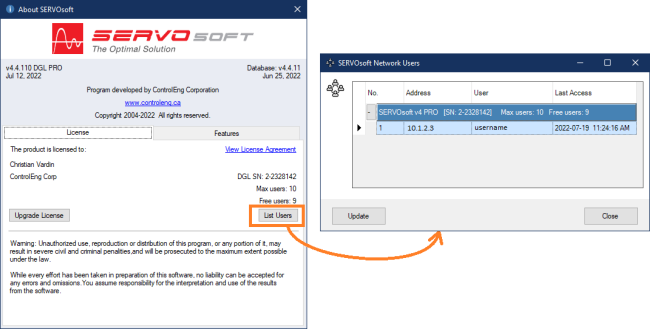 To install SERVOsoft, simply run the appropriate installation file (either the ACT or DGL version), and follow the instructions in the License Activation Wizard. The final step of the wizard requires you to send a license request email to ControlEng. Then ControlEng will quickly review the request and send you a license file. For the DGL version, first plug in the dongle into your machine. Then double click the license file, and when prompted, click yes to program your license. Note: Once you have purchased a license, a USB dongle key will be shipped to you within a few days. 4 . What are the system requirements for SERVOsoft v4? 5 . Why is servo system sizing important? An undersized design will fail to meet performance requirements, and in extreme cases, can overheat and damage components. In many cases it is safe to use an oversized motor, and this is what occurs quite often since the many calculations can be complex and time consuming. However, an oversized motor is not a cost-effective solution. Larger motors require larger drives, and most often lead to larger infeed modules, filters, bleeders, cables, etc., which in turn require a larger cabinet enclosure to house the components. Over sizing has a ripple effect throughout the entire design. Usually larger components, be they motors, drives, gearboxes, etc., are higher priced than smaller units. Finally, an over sized design increases the long term operating costs as the design is inherently less energy efficient. In summary, most engineers will over size because it is the easier and safer approach. However, over sizing increases the initial system cost as well as the ongoing operating cost of a servo system. 6. How accurate is SERVOsoft? As with any model, the outputs are only as valid as the inputs are accurate. With today's 3D CAD models, inertia and mass values tend to be very accurate. However, usually the unknowns involve stiffness, friction and thrust values. Experience, good judgmenet and a database of previous models can greatly reduce the 'unknowns' to very reasonable approximations. Once the actual system is modeled and benchmarked with SERVOsoft, detailed studies and scenario analysis can be performed with ease, yielding exceptionally precise results in the order of less than 1% error margin. In the hands of an experienced user, SERVOsoft is the complete design and modeling tool, allowing complex cost efficient decisions to be made quickly, and accurately…with confidence. 7. Can SERVOsoft model any vendors' products? Yes. SERVOsoft is a generic model for motors, drives, infeed, bleeder and capacitor modules, gearboxes, couplings, rack and pinions, ball screws, etc. This is because all calculations are based on industry standard rating methods and physics. In the area of gearbox life and input and output bearing life calculations, gearbox vendors tend to differ in how they rate their products. Therefore, SERVOsoft is structured to support different calculation methods for different vendors. If your calculation method is currently not offered in SERVOsoft, please contact us to see how we can add support for it. 8. Which inverter current rating does SERVOsoft use? Inverter current ratings can be confusing because not all manufacturers rate their inverters the same. Inverters have two current ratings, a peak rating and a continuous rating. The peak rating is the maximum current that can be generated for a brief period of time, usually no more than 5 seconds, typically 0.5 – 3.0 seconds. The continuous current rating is the maximum current the inverter can produce indefinitely. Some vendors rate their inverter current as RMS continuous, some as RMS peak, and some as peak. The difference can be significant. Note that difference can be as large as 2.82 times (v2 x 2 = 2.82). 9. Why are there so many charts in SERVOsoft? A raw numeric calculation is just a number. It provides little or no context as to how the number fits into the problem. Charts on the other hand, provide context and perspective to the calculation. A picture does paint a thousand words. Consider two numbers, a motor peak torque calculation, and its resulting peak torque margin. Together they provide good and needed information, but there is something missing. What is the shape of the peak torque curve? And what if we adjust the motion profile somewhat, can we get better performance? 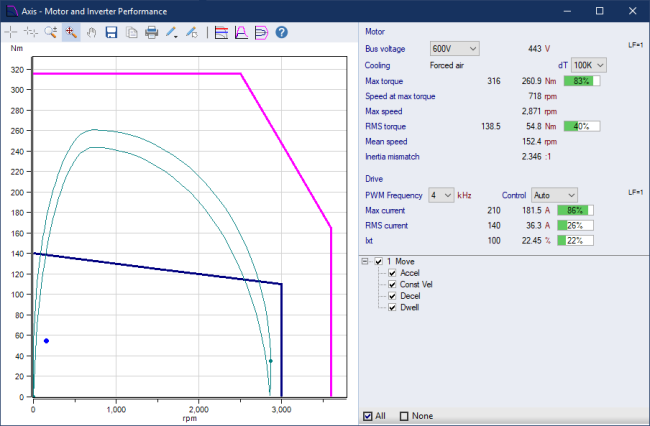 See the technical article on Servo System Optimization: Better Performance for No Cost, which explores this exact problem, and yields impressive results in the right circumstances. 10. How do I get SERVOsoft to work in Chinese? The Chinese language option must be enabled in your SERVOsoft license. The "Arial Unicode MS" font is usually installed with MS Office by default, but not always depending on the program version. The "Arial Unicode MS" font can also be purchased online. Please note that ControlEng has no affiliation or connection with any company wrt to the "Arial Unicode MS" font. By default, the "SimSun", "SimHei", "MingLiU", and "FangSong" fonts are usually installed on Windows 7/8/10 machines. 11. The Print to Word report is no longer available in SERVOsoft. What can I do? In v2, users could print the report to a Word document. This feature is no longer available in v3 and newer. Only PDF and image files are supported. What can you do? There are a few options including some online tools that convert a PDF to a Word document, but they generally do not do a great job. Word 2013 and newer supports opening and editing PDF files and works well. And there is one desktop application we found that for a modest fee, properly converts the SERVOsoft PDF report to a Word DOCX file. 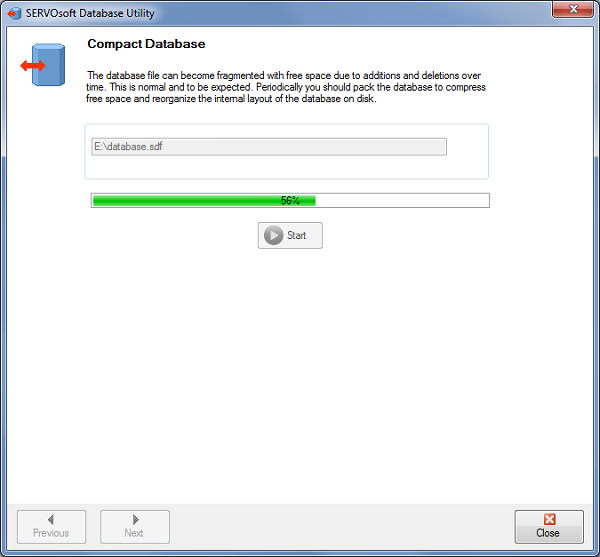 It is Solid Converter by Solid Documents (www.soliddocuments.com). Please note that ControlEng Corporation has no affiliation with Solid Documents, and gets no compensation for making this recommendation. We are just trying to help those few users that really need the SERVOsoft report in a Word file. 12. How do I check or change my Windows Locale settings? Click 'Start > Control Panel > Regional and Language Options'. 13. Can SERVOsoft run on 64-bit machines? Yes, SERVOsoft runs on 64-bit machines. Since v2.9 was released in 2010, SERVOsoft supported 64 bit machines. In fact, SERVOsoft v4 takes full advantage of Windows 64-bit with better performance and larger memory space. Please see the FAQ#4: System Requirements for details. 14. Why does the Program or Database Update Check Fail? The program or database update check fails with a time out or "Able to connect, but not able to download". It means that SERVOsoft is not able to check for a program or database update. The underlying cause is that SERVOsoft is not able to download files from the Internet. So an update check is not possible and times out. This is usually caused by one of 2 possibilities. A common cause of this problem is that the PC firewall is blocking SERVOsoft download access to the Internet. The solution is to give the SERVOsoft.exe firewall access to the Internet. However, the most common cause of this problem for larger companies with a proxy server is two fold. First, the wrong proxy server settings. And second, the proxy server may allow the user to access the Internet, but it still may be blocking the SERVOsoft.exe download access to the Internet. Then speak with the IT Administrator who manages the proxy server, and ask to grant SERVOsoft.exe download rights to the Internet. You can disable update checking by selecting 'Never' as shown below. And if you choose to disable the update checking, and SERVOsoft has download rights, then you can make a manual update check from SERVOsoft as shown. 15. How do I perform an unattended network MSI install of SERVOsoft? Often an IT Admin will want to automate the installation of applications on workstations. This is usually done by an 'unattended network MSI install', and can be done using the following steps. Extract the MSI and other files from the "setup.exe" install package. Run the Windows Command Prompt as an 'Administrator'. 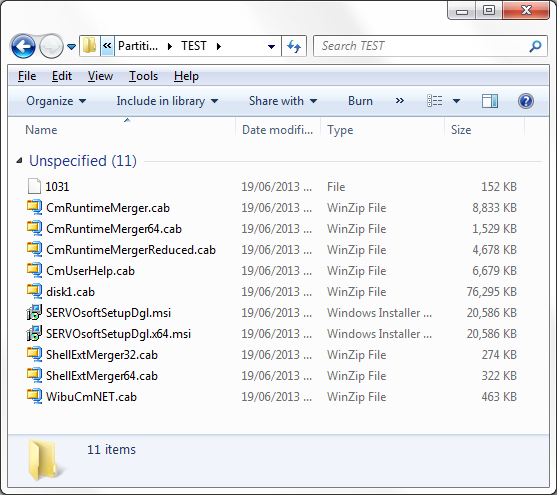 Then use the "setup.exe /extract" command line to extract the following files. 1. How do I upgrade my ACT or DGL license? SERVOsoft ACT or DGL must be installed on your machine. If using the DGL version, plug in your USB license dongle into your machine. Follow the steps in the License Activation Wizard. The last step of the wizard requires you to send your license request file to ControlEng. We will promptly create your license upgrade file and email it to you. Copy the new license file to your hard drive. If using the DGL version, make sure your USB dongle is plugged into your machine. Double-click the new license file. Your license has been upgraded. 2. How do I configure a License Server with one or more shared SERVOsoft licenses? Whether using a Network Dongle or a Stand Alone Dongle, SERVOsoft must be installed on each user's machine. In the diagram below, this means on every Local User and Remote User's machine that wants to use SERVOsoft. The License Server software only needs to be installed on one central machine that can be seen by all SERVOsoft users on the network. The server has minimal hardware requirements since SERVOsoft does not run on the License Server. Note: A Network Dongle programmed with several shared licenses can also be used as a Stand Alone license by simply connecting it to a PC with SERVOsoft installed. The only drawback is that the multiple licenses are not available to other users. This capability is useful for testing purposes to validate the dongle is programmed with the correct license and functioning correctly. 3. How do I get my network license to work over a VPN? A common problem when trying to get your network license to work over a VPN (e.g. Citrix), is proper firewall configuration on the Windows client machine. Simply enable the UDP port for ServoSoft per the image below. 4. How can I see who is using the network licenses? 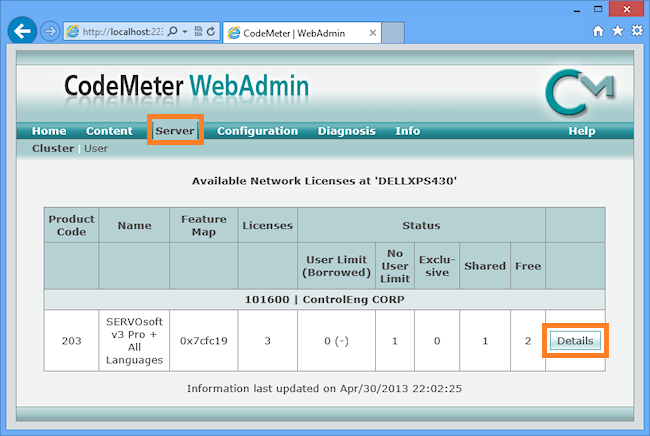 If you are a Network Administrator, you can use the CodeMeter WebAdmin tool on the network license server, which provides more details, and also allows you to 'Cancel' a user to free up a license. 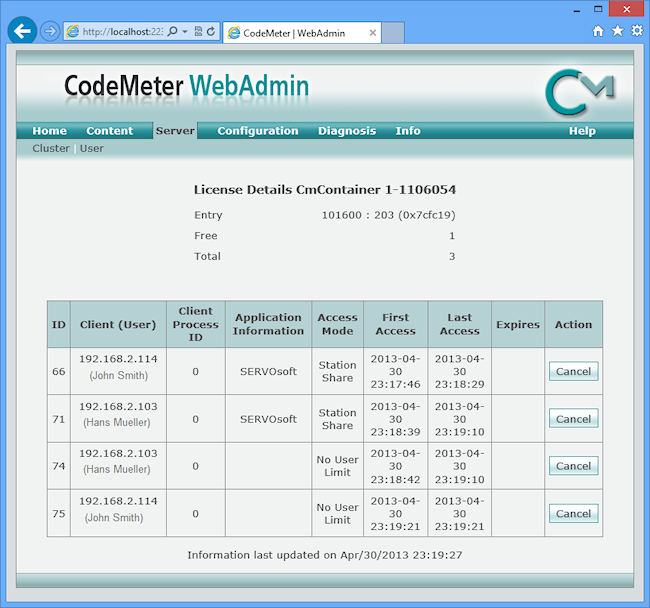 First, on the network license server, launch the CodeMeter Control Center. You will see your CmStick Dongle in the License list, confirming that the dongle is connected and seen by CodeMeter. Then click on the 'WebAdmin' button. Then click the 'Details' button where all active users are listed. In this case shown below, there are two active users- John Smith and Hans Mueller. You can see their names, IP addresses, etc. And if for some reason you want to bump a user to free up a license, click the 'Cancel' button for the 'Station Share' license you want to release. Note that for each of the two used network licenses above, there is also a 'No User Limit' container, which is used by CodeMeter to allow SERVOsoft to run unlimited instances on each user's PC that is using a network license. The 'Station Share' container is the network user license. 5. How do I remove expired or unwanted SERVOsoft ACT licenses? 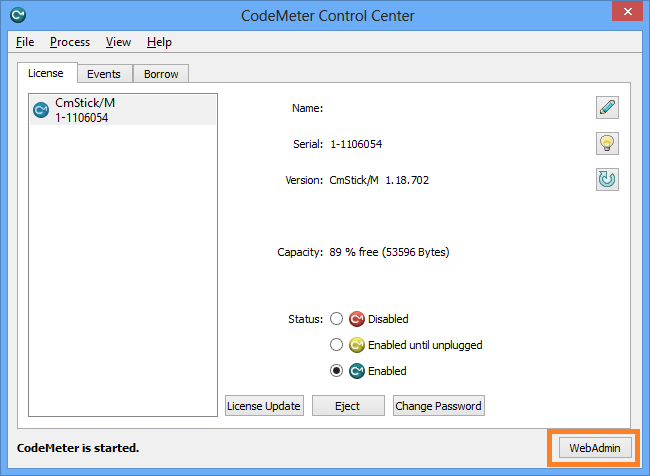 Open CodeMeter Control Center, and select the license you want to remove. 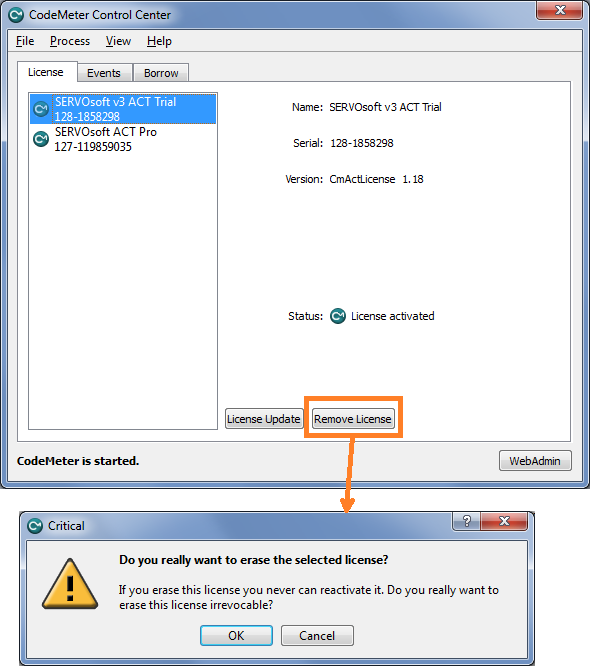 For example, license SERVOsoft v3 ACT Trial [Serial: 128-1858298], which is highlighted below. Next click the 'Remove License' button, and a message box appears asking you to confirm you want to erase the license. Then click OK and the license will be deleted. The above method should work 99% of the time. However, if the 'Remove License' button is disabled, then do the following steps to remove any unwanted licenses. 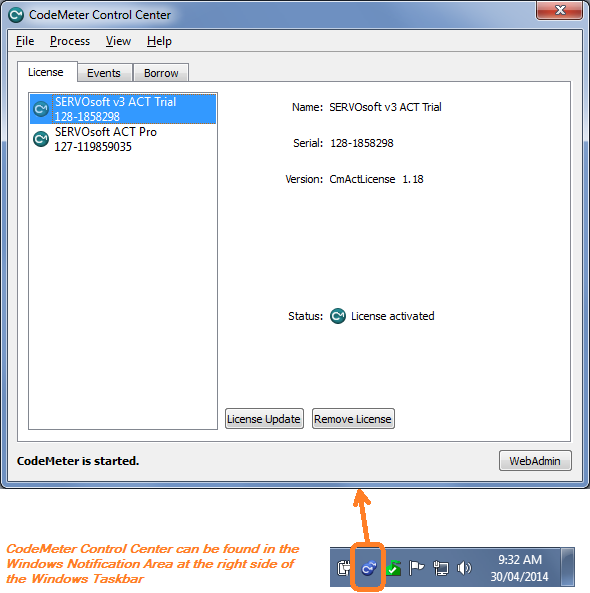 Find the file that is representative of the CodeMeterAct License, which in our example is SERVOsoft v3 ACT Trial [Serial: 128-1858298]. Therefore, the file we need to look for is 5000116_128-1858298.wbb. 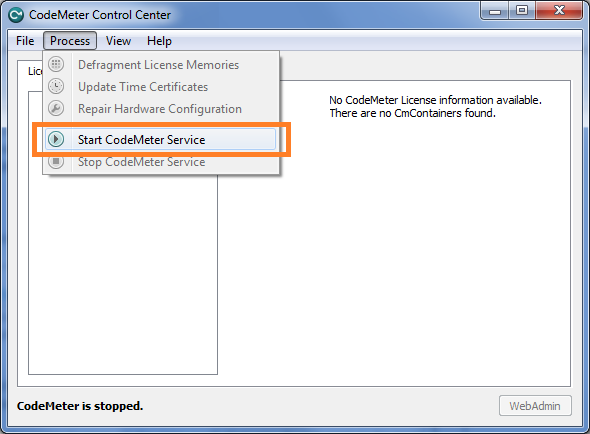 When the CodeMeter Service is started, the CodeMeterAct License will be gone. 6. 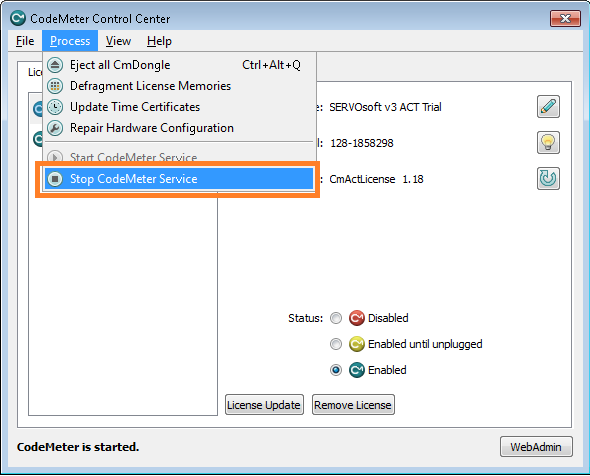 Can I have multiple SERVOsoft ACT licenses on the same PC? Yes. 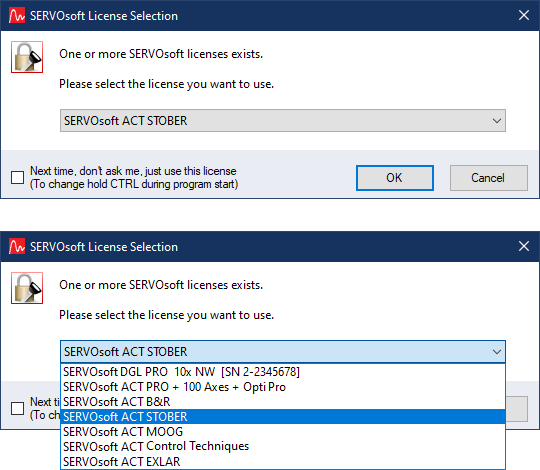 SERVOsoft ACT allows you to have multiple licenses at the same time. This is very useful to sales people and distributors who support multiple manufacturers, and therefore need to use more than one SERVOsoft manufacturer version. 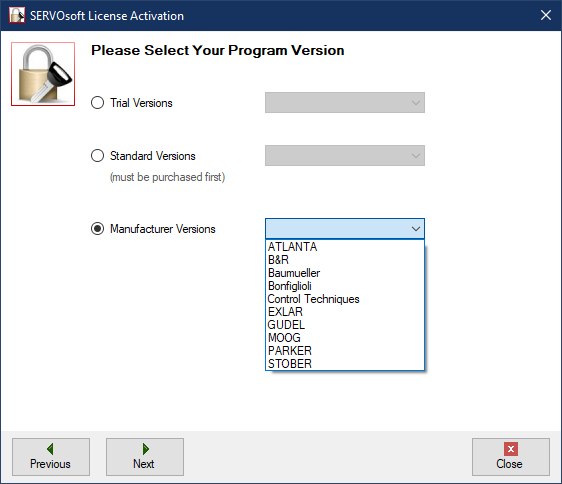 When more than one license exists when the program starts, you are prompted to select which license you want to use. Next time the program starts, the previous license is selected by default. And if you know you want to run the same license all the time such that you do not want to be prompted each time the program starts, then click the "Next time, don't ask me, just use this license" checkbox. And then if you want to force the select license window, hold down the CTRL key when the program starts. So how do you add a licenses to the above list? Same as always, make a new license request. Then click 'Next' and follow the rest of the wizard steps as usual and send your license activation request email. 7. During License Validation, why do I get 'Internet Connection Not Available' or 'Time Out' errors? Almost always, this is either a proxy server and/or a firewall issue. First, if your PC connects through a proxy server, you need to enter the same proxy settings used by your browser. In SERVOsoft, goto 'Tools > Options' to open the Options form and click on the 'Internet Connection' tab, per the screenshot to the right. Select the 'Use Proxy Parameters' checkbox and then enter your proxy parameters. Next check your Windows and/or other local software firewall and allow SERVOsoft download access to the Internet. Once 1 and 2 above are done, try connecting. If it is still blocked, then most likely it is an external firewall that is blocking SERVOsoft. In this case you need to speak with the IT department to allow SERVOsoft download access to the Internet. 1. How can I add my products to the SERVOsoft database? 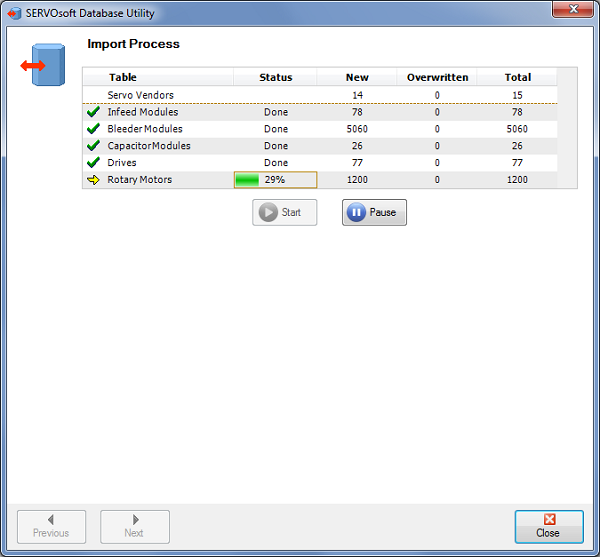 There are two of methods to add or edit product data in the SERVOsoft database - Add/Edit Database Forms and the Database Utility using the database spreadsheet. You can manually enter product data directly into the database with the built in Add/Edit database forms. Simply open a database listing, then click either the "New" or "Edit" buttons at the top right of the form. See image below for editing an existing coupling's data. For other licenses such as the manufacturers versions, users can view the product data, but the ability to make and save any changes is disabled. If the vendor you want is not in the drop down list, click the 'Vendors' button to the right of the Vendor drop down list. 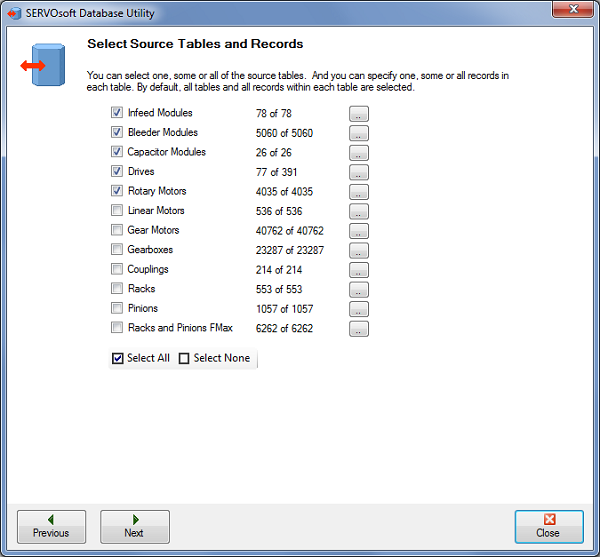 Note that the 'Vendor' and 'Model' fields combined, uniquely define the record in the database. These are known as Primary Keys. Then change all the parameters as needed. Finally click the 'Apply' button to save the record to the database. 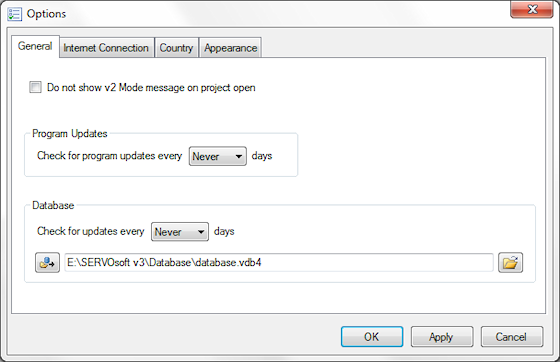 The Database Utility in v3 was built to manage the importing of product data from a "source" spreadsheet or database file to a "target" database file. The target database can be used to test the data locally before sending the spreadsheet to ControlEng for publication; and/or simply use the database privately, shared within an organization, as well as colleagues, partners, customers, etc. If you are a vendor or distributor, and/or you have 100s or 1000s of products you want to add, we can include all your products in the SERVOsoft database for distribution to all SERVOsoft users around the world. Please contact us for all the details. 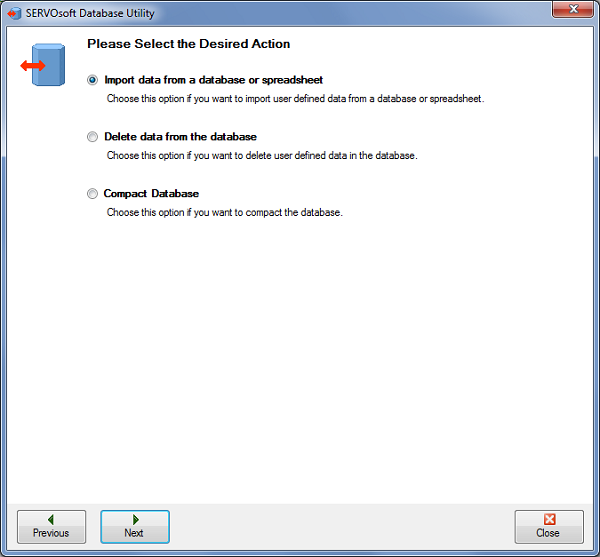 Start with the database spreadsheet, which is in the default database folder at C:\ProgramData\ControlEng\SERVOsoft v4 DGL\Database\, or can download the latest at the Product Data Entry page. The spreadsheet contains worksheets for rotary motors, linear motors, gearboxes, couplings, drives, infeed, bleeder, capacitor modules, racks, pinions, ball screws, linear actuators, etc. 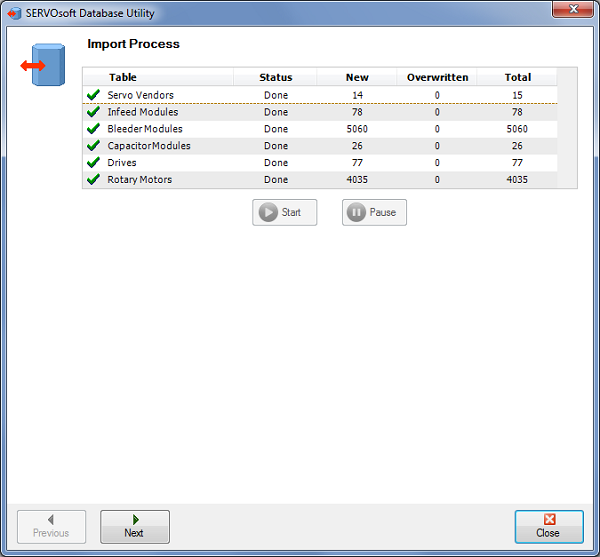 Start the Database Utility and select 'Import data from a database or spreadsheet', then click 'Next'. Then select the Source and Target files. 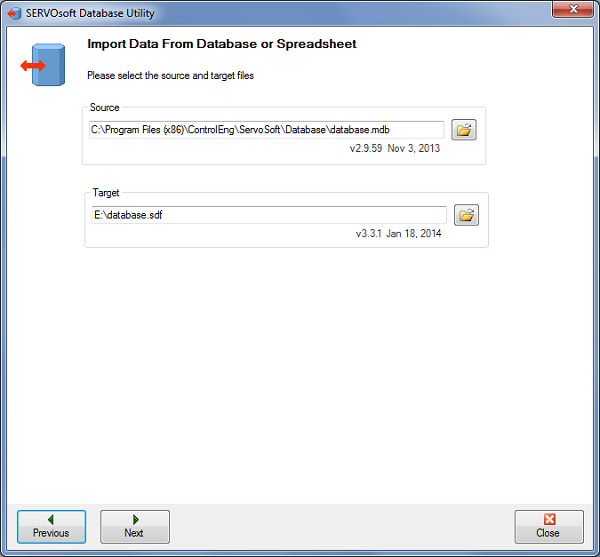 The source file can be a v2, v3 or v4 database spreadsheet (see here), or a v2 database (.mdb), 3.2 database (.vdb4) or a v3.3 / v4.x database (.sdf). The target must always be the latest v4.x database file. Ie. Always importing from older to newer. Note: It is recommended to make a copy of the target database file, and work with that. This way, in case you make a mistake, you always have the original database file. Then click 'Next'. The utility will examine both the source and target datasets, and look for differences in data. It will also check for duplicates in the source. In most cases, products are uniquely defined by the Vendor, Model combination. If there is a duplicate Vendor, Model, the utility will inform the user and stop the process. In this case, the user must correct the source data to proceed beyond this point. The next step allows the user to choose from the source file, specific tables, and products within those tables to include or exclude in the import process. By clicking the ".." button beside each table, the user can open the specific table of products and choose which products to include or exclude. 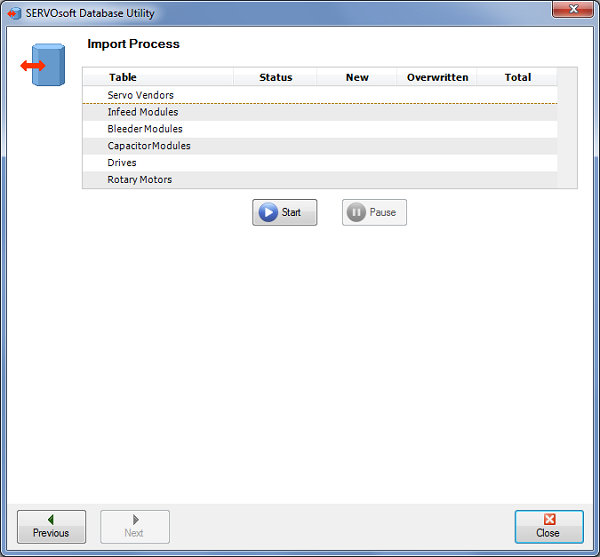 After selecting the specific tables and products, click 'Next' to go to the import step. Then click the 'Start' button to begin the import process. Done. Click 'Finish' to close the wizard. 2. How do I get the latest database updates? Note: If you are behind a firewall, you may need to ask your IT department to allow SERVOsoft to access the controleng.ca web server to get the updates. 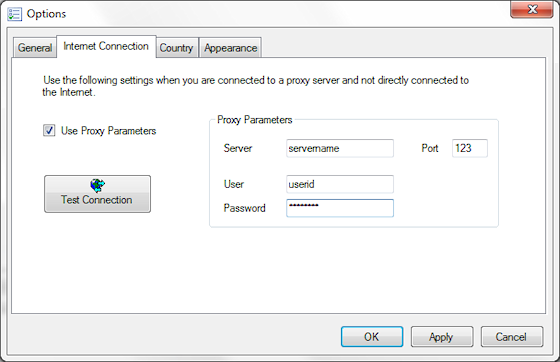 You can enter your proxy server settings in SERVOsoft under Tools > Options, under the 'Internet Connection' tab. 3. Which products are in the database? The database included in the Trial version contains a limited number of products with older data that is not revised over time. The Trial version is meant for evaluation only. The database included in the Lite, Advanced and Pro versions is extensive, and continues to grow every month. Get the latest database updates at any time using 'Tools > Update Database'. 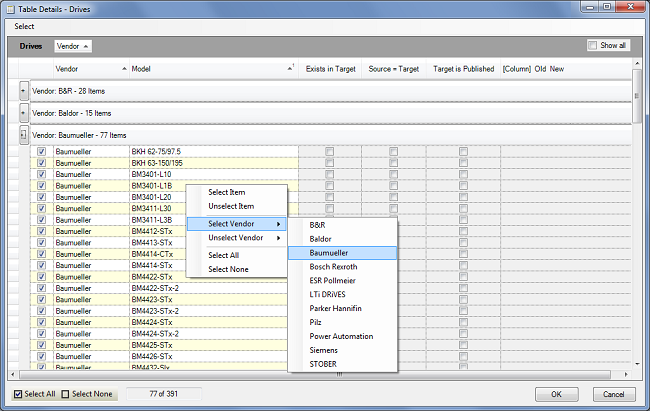 And of course, the Lite, Advanced and Pro versions allow users to add, edit or delete any product in the database. Licensed users have full control of their database file. If you would like to see other products added to the database, please see our Product Data Entry page. 4. Why does the Program or Database Update Check Fail? The program or database update fails, and I get the error "Internet connection not available" or "Download Error". Or in the Options form, when I test my Internet connection, I get the error "Able to connect, but not able to download". The 3 steps above should solve the problem. However, another option is to download the database update directly from our Database Download page.